Patterns of social organization and interaction vary from culture to culture, from one social context to another, from one generation to the next. In any particular culture or context, established patterns signal and enforce appropriate action. Such patterns — i.e., institutional patterns — have been conceptualized in various ways, at various levels of resolution. One notable approach is called institutional logics. Recently, anthropologist and philosopher Bruno Latour weighed in his own approach, published as both book and augmented website. It’s called An Inquiry into Modes of Existence: An Anthropology of the Moderns. “The institution is back,” declares Latour. Indeed, institutional analyses, syntheses, re-imaginations, and transpositions are critical to the development of social patterns that better support the flourishing of life. In this post I’ll introduce logics and modes, while pointing out a couple of comparisons. Finally, I would note that when considering a career in government service, it is useful to think about the implications of the grand logics of different types of organizations (cf. Weber 1922; Dobbin 1994; Meyer and Rowan 1977; Meyer and Scott 1983; DiMaggio and Powell 1991). We all know, for instance, that those working in for-profit businesses generally judge a given person’s performance through monetary means. It is only more rarely that we reflect on the fact that those working in government agencies tend to judge personal performance through metrics of power. In my experience, it is rarer yet that we admit the truth about academic institutions: that people are judged almost entirely in terms of reputation (and not just one’s own, but more broadly that of one’s advisor as well as one’s institutions, both past and present – see Etzkowitz, Kemelgor and Uzzi 2000). Switching from one field to another usually necessitates that one be prepared to operate under a different set of institutional rules and expectations. In the case of moving from the academy to the state, this means (among other things) caring much less about what people think about one’s work, and caring much more about making things happen. 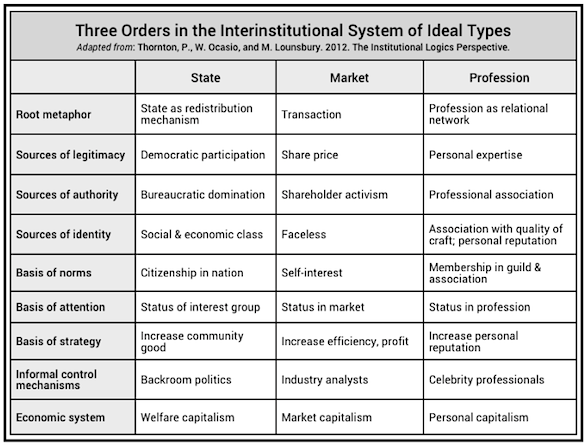 Ideal types are, well, idealized, and any particular organization or system or “institutional field” might be understood as combining “multiple, fragmented and contested” facets or dimensions from among logical types (Schneiberg and Lounsbury, 2008, pdf). 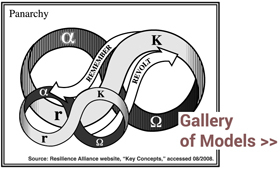 Latour’s project is to develop a synthetic typology of these modes — “the things that humans concern themselves with — and the questions they ask themselves.” He currently lists fifteen in total: reproduction, metamorphosis, habit, technology, fiction, reference, politics, law, religion, attachment, organization, morality, network, preposition, and double click. Another distinction between logics and modes is not in the typologies themselves but in the stance of the writers. Logics writings generally take an academic, third-person stance. Latour’s writing (regardless of one’s opinions of it) takes a moral stance — in contemporary lingo, a transdisciplinary or action research stance. He’s directly engaged. How do we compose a common world? Not so long ago, the pro­ject that would have seen mod­ern­iza­tion spread over the whole planet came up against un­ex­pected op­po­si­tion from the planet it­self. Should we give up, deny the prob­lem, or grit our teeth and hope for a mir­a­cle? Al­ter­na­tively we could in­quire into what this mod­ern pro­ject has meant so as to find out how it can be be­gun again on a new foot­ing. [W]e shall not cure the Moderns of their attachment to their cherished theme, the modernization front, if we do not offer them an alternate narrative made of the same stuff as the Master Narratives whose era is over — or so some have claimed, perhaps a bit too hastily. We have to fight trouble with trouble, counter a metaphysical machine with a bigger metaphysical machine. Still, there’s a difference between the passive voice and the active one. For anyone committed to change, the question becomes: How might I be most effective? Thanks for letting us know about the relationship between Latour’s book on modes of existence and institutional logics. I’ll have to read the book but from the Google translation of the website, there are also hints of Bourdieu’s habitus in Latour’s descriptions of modes of existence. Hi William — yes i thought about habitus as well, tho it doesn’t come up as referenced in the AIME search engine. Thanks for letting us know about Latour’s book and its connections. Lookingforward to reading it. You make an interesting distinction between logics and modes in terms of academic versus moral. The institutional logics perspective is a meta-theory and analytical tool to comparatively evaluate the different theories of morality associated with the different institutional orders. This allows as you note the analysis of patterns of morality to vary over time, culture, and social context. Thanks, Patricia — per “theories of morality associated with the different institutional orders,” would that be a category on the Y Axis, akin to “root metaphor” &etc.? Yes, morality would be on the Y-axis. In theory its characteristics should vary across institutional orders, some more than others. For example, people today may not think of the market logic as associated with theories of morality, but one can point to Adam Smith’s theory of morality sentiments as an example. Whether this theory of morality is salient or popular today or appropriate in any social context is another question–and that is, what theory of morality is outcompeting it in society and why. Steve Vaisey and I have had some preliminary discussions about further developing this line of research on morality and we welcome comments on it. My question is what are the theories of morality that underlie the professions logic. The reason I ask is because we have done an informal meta-analysis of institutional logics studies and find an interesting “pattern.” The boundaries of the professions are folding to the market logic, when their origins were to keep the market honest. I do like your attention to both theory and practice. Next post: The strong case for biodiversity? They are us.